Remember when you could eat absolutely anything you wanted? When picking up sushi, making a French dinner at home, or trying out every recipe from Gourmet or Martha Stewart Living was not just a treat but an almost daily habit? I know I do. But with small kids, having all the ingredients I need for those meals often takes me several trips to the grocery store (because even a detailed list doesn’t guarantee a successful shopping trip when I have two little ones with me), and although I rarely give my kids foods that are deemed child-friendly–like chicken nuggets–I miss a certain level of spice and creativity in my meals. I have found a way to upgrade toddler food to a level that is actually delicious without having to break out a whole new set of kitchen utensils and ingredients just to prepare my meal. I still miss eating more creative food, but at least I am out of the toddler food rut. 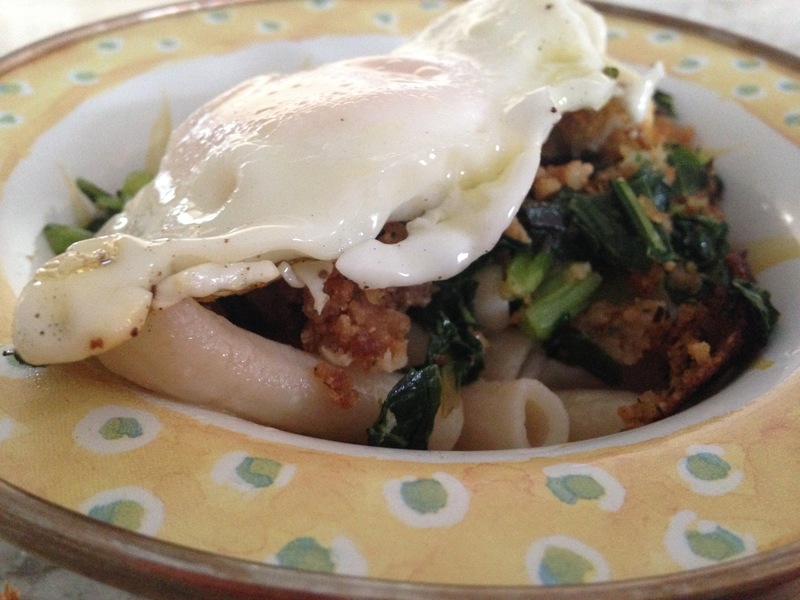 I thought this–fried eggs over fried spinach and bread crumbs, over pasta–would be a hit with my kids. It was not, but I tried, and I loved it. Mac and Cheese: I serve a homemade version of this family favorite with broccoli and cheddar once a week for my kids. Then add a pinch of nutmeg and a dash of powdered garlic for my super-fast, grown-up version. If you have any other kind of cheese lying around, especially Gouda or anything blue, use it! Grilled Cheese: I make my kids’ the traditional way and serve it with slices of pears. Then swap the American or Cheddar for Brie cheese for mine, and add the pear slices to the sandwich. A couple of minutes on a hot pan, just until the cheese starts to melt, and it is ready. If you happen to have a hearty bread on hand–instead of sandwich bread–use that instead. Butternut Squash Soup: I make it with coconut milk for delicious flavor, creaminess and added good fats. Then add to my bowl a nice amount of curry powder for an exotic flavor. Breakfast for Dinner: I make eggs my kids’ favorite way. For me, I lightly fry a corn tortilla on both sides, while still on the pan crack an egg right on top; pinch of salt, pinch of smoked paprika then flip so the egg cooks on the other side; fold, and wrap in foil or wax paper and eat with my hands for a food truck/street taco experience. It is messy and so good. Sandwich and Salad: If I am making egg, chicken or tuna salad sandwiches for the kids, I set aside the protein for me and don’t mix it with mayo. Then I put some lettuce on a bowl, add the tuna, chicken or hard-boiled eggs. I search my fridge and pantry for anything that I could add to make a Café-style salad, such as chickpeas, red onion or olives and dress with EVOO, lemon, salt and pepper. While these tricks are great, I encourage everyone to be adventurous when making food for kids. My kids often surprise me with the things they’ll eat, and the things they won’t, like the recipe for the meal pictured, which you can find in the awesome food blog Smitten Kitchen. (Disclaimer, I added spinach to my version) My rule is that they need to try new things, if they do and don’t like it they can have something else. You can see here my other ways to help my kids eat healthy and varied foods. Getting negatives after spending a good amount of time cooking is frustrating, but you could end up feeding your kids something you are actually looking forward to eating too. Plus PB&J can be just a few minutes away. What is your easy go-to adult meal at home? I can always use more ideas.